What is color temperature and is it important when searching for a light bulb? The Color Temperature of a bulb describes the color of light emitted from the bulb. Colors range from “warm”, which occurs at around 2700 Kelvins, to “cool bluish” which occurs at around 5000 Kelvins. How do you know what color temperature is best for you? 2700K-3000K: This color temperature bracket releases a warm light that gets softer as the temperature increases. Most incandescent light bulbs, as well as many florescent bulbs, give off this light. Bulbs with this color temperature are generally used for household rooms as they are the bulbs that most people are familiar with. 3500K- 4100K: This color temperature bracket releases a light ranging from cool to bright white. Uses for this bulb include kitchens and office spaces as the brighter, whiter light gives the room a more professional feel. temperature increases, the bulb releases a harsher, bluer light. This harsh light is used in fields where one wishes to see with the utmost clarity, such as architects drawing on white paper. Each light bulb emanates a different type of light based on their color temperature. 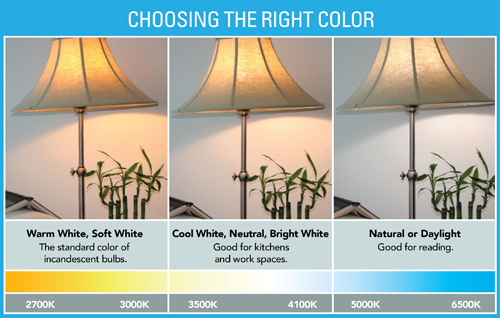 You can choose which kind of light best suits your needs based on the descriptions above and the chart below. On our website, Bulbamerica.com you can find an abundant amount of bulbs with varying color temperatures to satisfy your every need.